Coptic Monasticism’s strong and beautiful history carries with it a stream of saints whose lives attest to a profound love for our Lord Jesus Christ. These righteous men and women freely chose to forsake the vanities of the world in order to dedicate themselves fully and wholeheartedly to God in solitude and unceasing prayer. In the stillness of the desert of Egypt, theirs was a life of discovery; no longer surrounded by a plethora of distraction, they were better able to truly get acquainted with themselves – to uncover their sinful nature and come to the wonderful realization that their strength was found only in Christ. 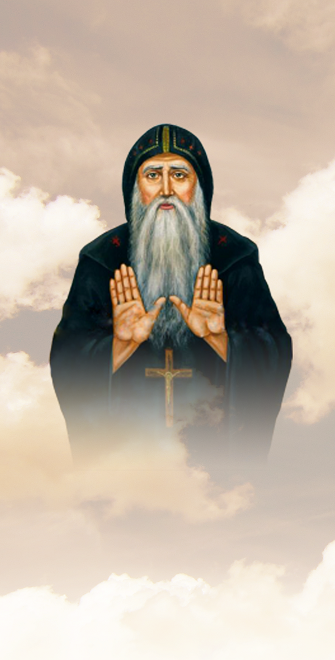 Saint Isaac the Syrian said, “a person who has attained to the knowledge of his own weakness, has reached the summit of humility (St. Isaac the Syrian) and so as they broke through the constraining walls of their ego and climbed great spiritual heights to live out a blessed life of repentance and asceticism (HH Pope Shenouda III). In the 4th century in Egypt, born to wealthy Christian parents, Saint Antony the Great responded to the call to sell all he had and follow Christ. Now widely referred to as the Father of all Monks, St. Antony was the first courageous soul to have ventured into the wilderness in search of that pearl of great price. He is one of those unforgettable saints in history who paved a difficult and beautiful road to a new way of life. He became the father of a new discipline – a very tough discipline – the discipline of renunciation of the world and complete abandonment of earthly things. When we choose the road to monasticism, we follow the footsteps of the saints who walked the path before us. We also seek spiritual guides to teach us where to begin and how to progress, to tell us the mysteries of this life and to help us recognize the deceits of the evil one and how to overcome them. 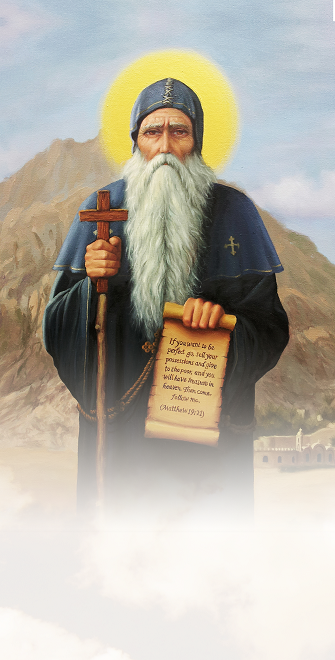 However, when St. Antony began his path there were no previous fathers to learn from the Lord our God was his only guide and thus he became a guide to all of us. He is not only the Father of all Monks, but he is also the Father of Monasticism across the world. Coptic Monasticism was born in Egypt with its first monastery established by St. Pachomius sometime between 361 and 363 A.D – Saint Anthony Monastery in the Red Sea – the oldest monastery in the world today. By the end of the fifth century, there were hundreds of monasteries, and thousands of cells and caves scattered throughout the Egyptian desert. A great number of these monasteries are still flourishing and have new vocations to this day. In the recent years, Coptic Monasteries have opened in Europe and North America and are continuing to grow yearly by the grace of God. Coptic monastics choose to live a life of prayer and contemplation. After a novitiate period, a nun joyfully takes the three vows of monasticism – chastity, poverty, and obedience – in order to better dedicate her life to God and serve Him only – as St. Paul said, “The unmarried woman cares about the things of the Lord, that she may be holy both in body and in spirit” (1 Cor. 7: 34). Out of her great love for God, a nun’s typical day begins while most people in the world are still asleep. Midnight prayers and praises begin daily at 4AM and are followed directly by Divine Liturgy. On Wednesdays and Fridays, when fasting and abstinence are observed, nuns return to their cells after the raising of morning incense and the Diving Liturgy is prayed at noon. All nuns have a personal prayer rule they must keep daily – “memorize the psalms and they will protect you” (HH Pope Shenouda III) – and a duty they must perform which can include anything from manual work to hosting guests – “if anyone will not work, neither shall he eat” (2 Thess. 3:10). Daily at 5PM, the nuns meet once again in the church to communally pray the psalms from the Coptic Book of Hours. Between work and communal prayer, a nun spends time alone in her cell in prayer and meditation. This beautiful life is likened to that of angels on earth. Just as the heavenly angels unceasingly praise and worship God, so too do the nuns and monks stand before God in praise and worship in their daily and blessed lives – “Angels are a light for monks, and the monastic life is a light for all men” (St. John Climacus). To pray for the Church. To keep their life holy as an example for others. To live such a quiet life in order to have a quiet heart and mind.Happy are those who follow this road and avoid other highways. Theirs is the kingdom of heaven. HH Pope Shenouda III when asked about the meaning of monasticism.